The HVUT is a significant source of transportation funding in the U.S. In 2010 alone, the HVUT generated more than $886 Million in Federal Highway Trust Fund (HTF) revenue. The figure shown below documents historic collections associated with the HVUT. The figure highlights three time periods of interest: 1984-85, 2001 and 2005-2008. In 2001, HVUT receipts slumped due to the sagging economy and its impact on the motor carrier industry. In recent years, the HVUT has rebounded due to economic growth and the incentive to pre-buy or purchase trucks prior to 2007 to avoid the new EPA emissions rule. In 2010, HVUT revenue represented approximately 2.9 percent of total revenue deposited in the Highway Account of the Federal HTF. The figure also underscores the importance and potential payoff associated with strong enforcement. On July 1, 1984, HVUT rates were raised to their current levels. 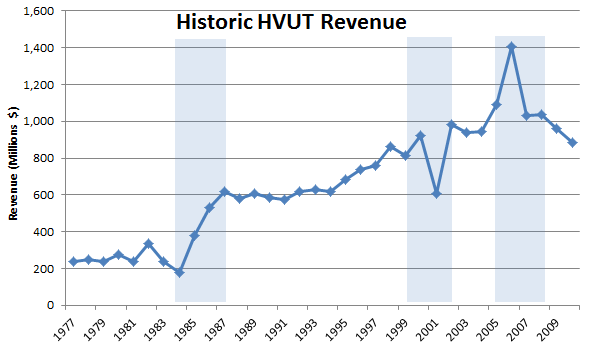 Not surprisingly, fiscal year (FY) 1985 HVUT revenues grew by nearly $200 million. On October 1, 1985, States were required to verify proof of payment as a condition of registering heavy trucks subject to the HVUT. In the year following introduction of this enforcement measure, HVUT revenues grew by an additional $154 million, representing an increase of nearly 41 percent.